Simply put, Andis BGRc is the luxury line of professional Andis clippers. Its most remarkable quality is the fact it’s a ceramic hair clipper – it stays cooler, its blades are sharper, and you can count on it for long-term durability. A rare breed among hair cutting tools, ceramic clippers are simply luxurious. They also stand the test of time better than their standard counterparts. Throw in the usual Andis quality as one of the best barber brands, and you’ve got a recipe for success. Despite its slightly higher price point, the Andis BGRc clipper outshines other professional clippers. How about you and me, together, explore what makes this ceramic piece of art so great by doing an Andis BGR clipper review? *If the button above doesn’t work, check out Andis BGR Clipper on Amazon.com here instead. The difference is simple: the black BGRc clipper is cordless, while its silver/grey version is a corded hair cutter. Their features are the same, it’s just that the cordless Andis BGRc gives you a more flexible approach to cutting your hair with clippers. It’s entirely up to you – pick the one that suits you better. In any case, you should receive 7 plastic Andis combs (size 1/16″ to 1″), storage kit, instructions and 4oz. bottle of Andis clipper oil with them. For the cordless version, you should also get the charging base. 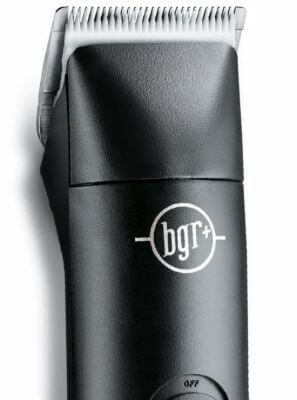 The BGRc ceramic clipper is 20% lighter and up to 10% smaller than other barber clippers. “Sure it is”, you’d think, sceptical that this is yet another marketing ploy. A usual problem with professional hair clippers is they feel heavy. As a result, you get tired after a few minutes of cutting hair. Andis BGRc minimizes such dreaded moments and its extremely ergonomic shape boosts its usability even further. You’ll benefit from its quiet operation too, as it scores way lower in terms of noise levels. The BGRc blades are where it’s all at. Both of them, size #1 and #000, are Andis’ famous CeramicEdge detachable blades. Being ceramic, they stay up to 70% cooler than your usual stainless steel clipper blades. In addition, ceramic is more durable in time, scoring sharp performance 4 to 5 times longer than standard blades. It’s not only about convenience. Andis BGRc ceramic blades cut through any hair without any issues. They score extremely higher in terms of versatility and sharpness and are on par (if not higher) than other Andis barber clippers. What powers these ceramic beauties is an Andis rotary motor, operating at 2900 strokes per minute. Remember, rotary motors usually outperform electromagnetic or pivot motors. You’re getting another perk with the engine hidden inside the BGRc clipper. The combination of high quality ceramic blades that stay cool and a powerful rotary motor make this Andis model the perfect heavy-duty choice. While not as great for fades as the Andis Master, it’s way lighter and skips on the dreaded heating. If you decided to go with the black, cordless version on Amazon, you will want to know how the Andis BGRc battery performs. Fitting the premium theme, it will last you for close to an hour, or around 5 to 6 average haircuts. Benchmarked against other cordless clippers, it outperforms models like Remington’s HC4250 and is a bit below Wahl’s Magic Clip. What really makes it great, though, is its recharge time. The BGRc battery can be fully recharged in just an hour. You literally will use it the same amount of time it will get recharged for! It’s also easily replaceable. In this Andis BGR clipper review, the main issue you might have with the BGRc hair clipper is its price. Even the corded version runs a bit higher than some other professional clippers. Yet, if you think about it, other barber tools lack its lightweight body, quiet operation, lack of heating up…and above all, the detachable ceramic blades. Another thing would be the NiCD (Nickel-Cadmium) batteries. While the battery life is more than great, NiCD is an older battery technology. 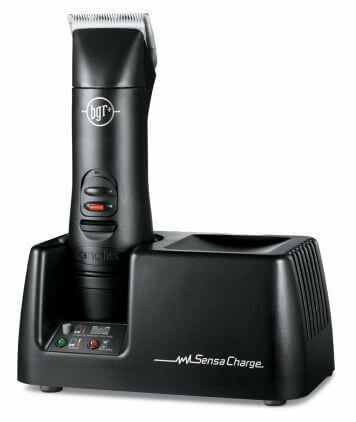 Most newer clippers run on Lithium-ion, which is the modern standard. Last but not least in this Andis BGR Clipper review, it’ll be a bit tricky to use this as a hair clipper for fades. As a detachable Andis clipper, BGRc will need you to swap out blades to perform “layers”. People searching for a balding clipper also need to think twice. The #000 won’t cut that close, but you can also fetch a #0000 size CeramicEdge blade. If you’re a beginner, detachable blades can feel overwhelming. If you think you can’t cope with them, just stick to an adjustable clipper. But, to be honest, Andis BGRc makes it really, really easy. You shouldn’t feel nervous about swapping out the blades. There’s no debate: the BGRc is for people who know what they want from their haircuts. It has really no equivalent among other professional hair cutters. Why don’t you pick the high way, then? Well I hope this Andis BGR clipper review has been helpful. *If the button below doesn’t work, check out Andis BGR Clipper on Amazon.com here instead. Pureology Hydrate Review: Is It Really Worth The Price? I have had a set of BGR+ clippers and now they do not seem to be working very well, I am not sure of the problem. Maybe battery strength? They just do not clip and bog down in the hair. What do I need to do? It might be the battery indeed – do you feel the motor has slowed down compared to before? How long have you had it for? If it’s still in warranty, Andis should be ready to assist you. Another possibility is leftover hair/debris BEHIND the blade. Not sure how often do you remove the blade and clean inside too? I’ve had quite a few models that were sparkly clean on the outside, but once I looked inside…a lot of stuff had piled up. I assume you’ve also oiled them after each use, right? My switch went out on my BGRC’s. Is it replaceable or do I need to buy new clippers? The switch is actually replaceable, but sadly, it is not as easy to swap out as with some other clippers like the Oster 76. If you are good at fixing small electronics then go ahead and try it yourself. Otherwise, if you get the part off of Amazon and then bring it to a small appliance repair shop, they should be able to do it for you. I would definitely try that before going and buying another one. of course, if it is still under warranty and you registered your clipper online with Andis, then you may be eligible for a replacement.